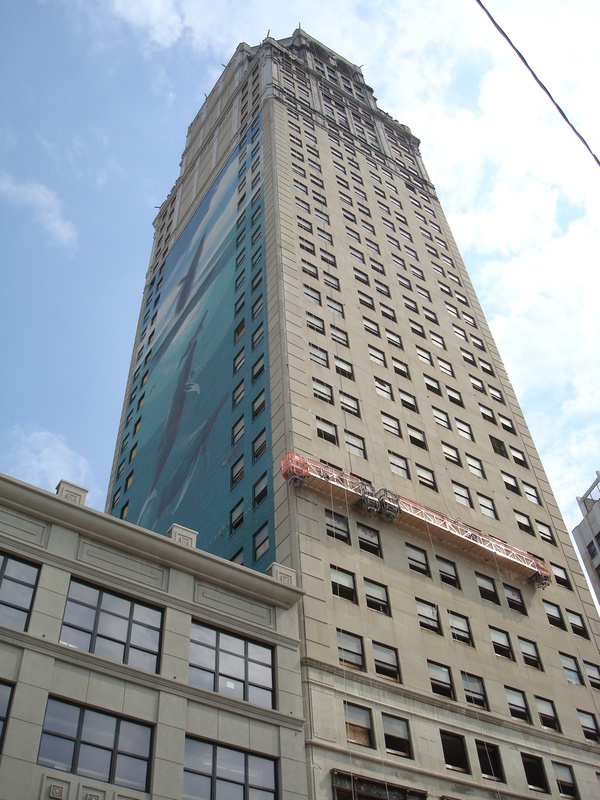 I can’t even begin to think of how many times we’ve been told that the Broderick Tower was slated for renovation. Each year an article in one of the newspapers, or a press conference or new sign hung on the building would explain details that would eventually never amount to anything more than broken dreams. Well, then what’s different about this go ’round? They are actually following through. Rather than only erecting scaffolding and attaching new flashy adverts, the Whales Building as it has come to be known by many has been gutted and work inside and out is in full swing. 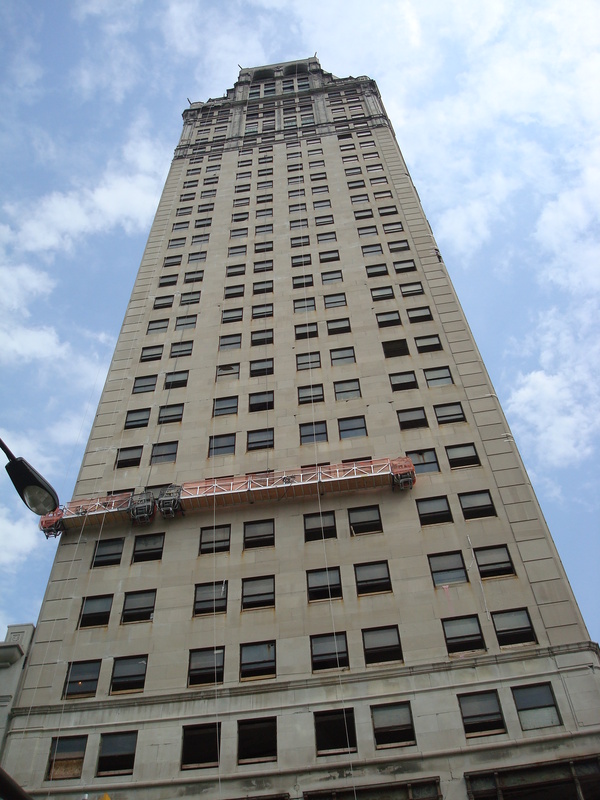 The Broderick Tower is finally getting its day in the spotlight as a mixed use building to house a new wave of Detroiters who could play a key role in bringing back a city that has been weighed down by bad press for decades. 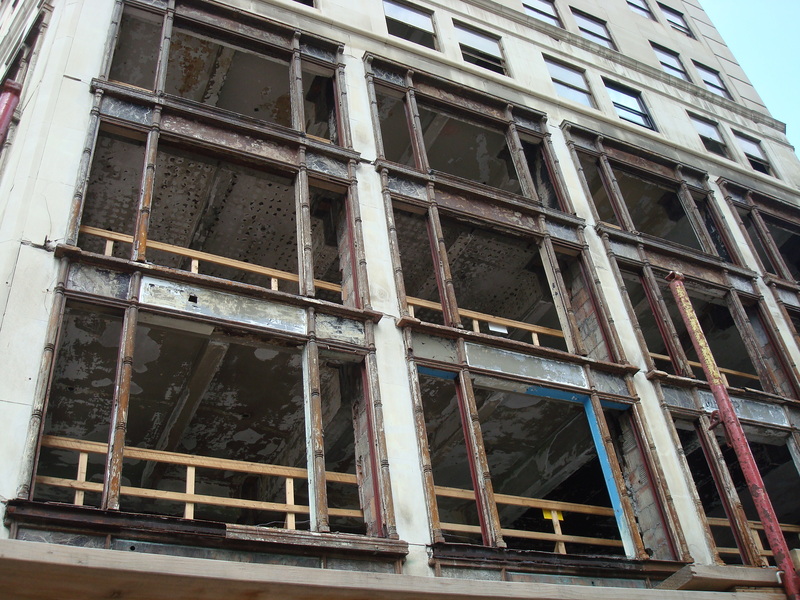 Downtown anchors Quicken Loans, Compuware, DTE Energy and Blue Cross Blue Shield of Michigan, are offering employees an incentive package to relocate closer to work with Live Downtown which carries benefits that mirror its sister program in Midtown. 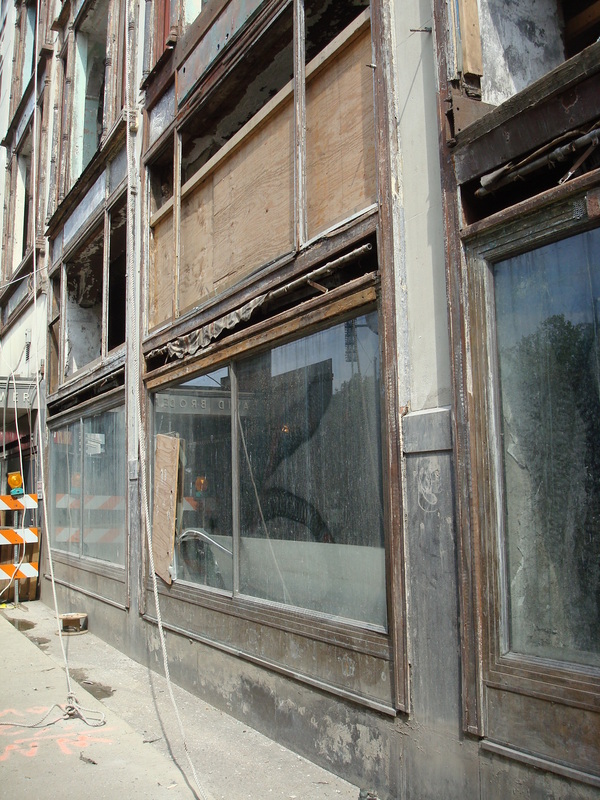 Several things need to be addressed before Detroit can get back on its feet–including the school system–but procuring and retaining residents is a key issue (especially in light of the Census 2010 numbers). This wave of young professionals could do wonders for the downtown area in terms of spurring growth for retail and dinning establishments. I only hope that the Whales mural is not altered and once the building is completed it won’t ever be covered up again by another mobile phone ad. It just seems wrong for it to be non-existent in the skyline view from seats at Comerica Park and I’m pretty sure the artist, Wyland, didn’t take the time to paint it to have it not be visible for all visitors to see. 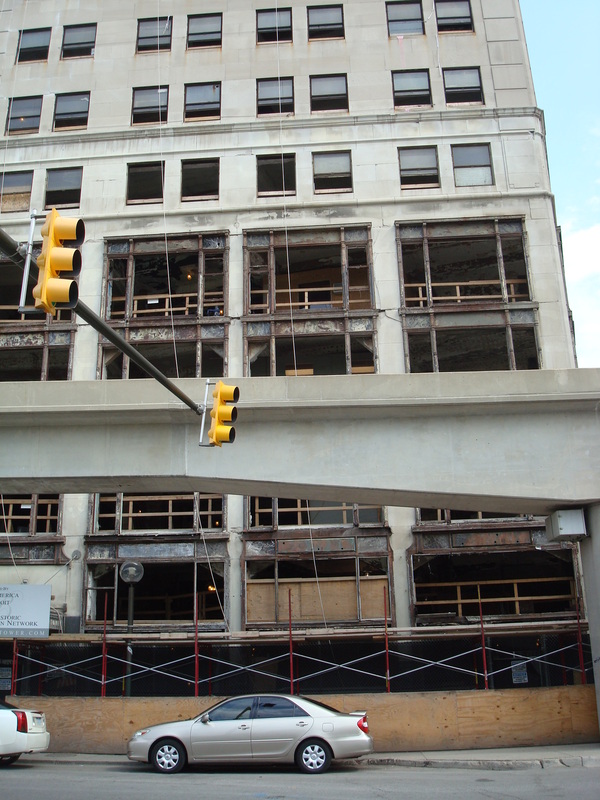 A few weeks ago the Detroit News published an article about the high interest from possible tenants of the yet-to-be-finished apartments. We can only hope this interest doesn’t fade and is something more than people just curious as to what they are going to cost and look like. There was a lot of buzz around the condos in the Book-Cadillac when it was being developed (I went to one of the open houses they held and there were many people eager to tour the model units, which I did as well) but most of those potential buyers fell through largely because of the recession. 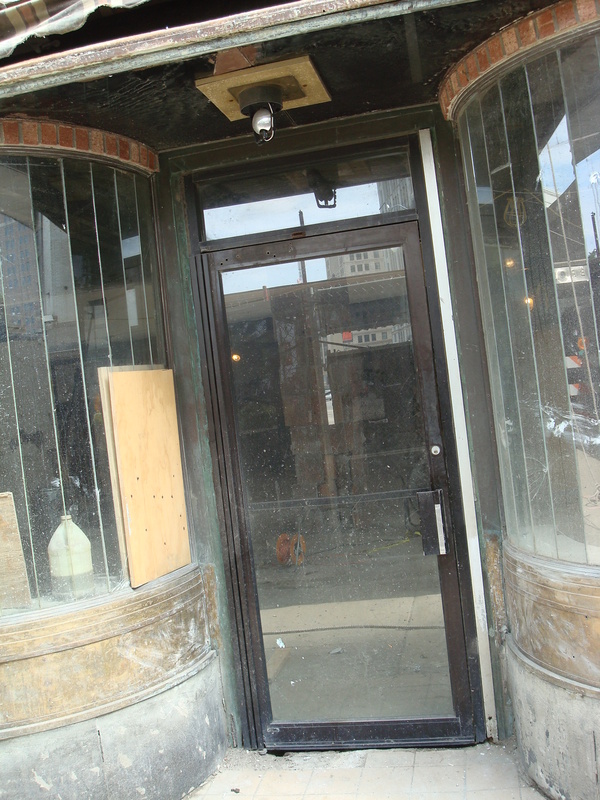 This entry was posted in Detroit, Photos and tagged apartments, blue cross blue shield, book-cadillac, broderick tower, comerica park, compuware, condos, dan gilbert, detroit, detroit news, downtown, fox theater, madison theatre, midtown, quicken loans, whales. Bookmark the permalink.